We all know that Afridi led Pakistan to a T20 win in his first match as captain with a match winning captain's knock of 50. We all also know that the knock was Afridi's third consecutive 50 in twenty20 internationals, following his effort in the semi final and final of the World Twenty20 a couple of months ago. But there was more that Afridi achieved during the T20 win over Sri Lanka. He joined Tilekaratne Dilshan, Sanath Jayasuriya, and Brendon McCullum as the only batsmen to score 3 or more consecutive 50s in T20 internationals. McCullum holds the record with 4. Afridi got his 6th man of the match award in T20Is, which puts him level with Sanath Jayasuriya for the most man of the match awards in T20 internationals. With his knock, Afridi became the 10th highest run scorer in T20Is for the calendar year 2009. He is also 11th overall. 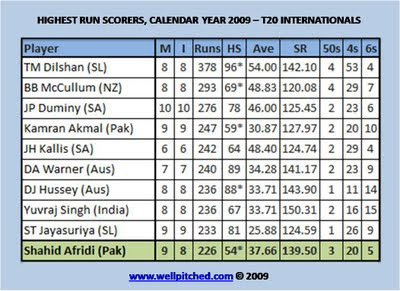 Among the top 10 run scorers for 2009, Afridi has the 5th best average. His 3rd man of the match award in as many T20 internationals is a record for most consecutive MOTM awards in T20Is. Till before the World T20 in June, Afridi's achievements in 20-20 cricket revolved around his bowling. He was the leading wicket taker in this format for some time; he won the man of the series award in the 2007 World T20 due to his bowling effort; he has been the 2nd highest wicket taker in 20-20 cricket for a long time now. Now his batting has also started to talk; and how. Did you see how he hit Malinga for 6 using just his wrists! ?